You’ll find your professors eager to mentor you in designing a collaborative research project that engages you in real science, even as an undergraduate. Dentists do much more than clean and care for teeth and gums. Dentistry can improve a person’s overall health and quality of life. When you pursue a pre-dental course of study, you pave the way to a meaningful medical career that makes a difference every day in the lives of your patients. At St. Norbert, you will work with a pre-dental advisor to ensure that your undergraduate studies prepare you for admission to your dental school of choice. You’ll complete a minimum of three years of science-focused undergraduate work, depending on dental school requirements. During your pre-dental study, you’ll also take the Dental Aptitude Test to verify that you are qualified and on the right track to a career as a dentist. With a growing body of research showing a strong connection between oral health and overall health, demand for excellent dentists has never been higher. Employment in the dental field is projected to grow 20 percent from 2010 to 2020. As a pre-dental student, you may be eligible for the William Thiel Scholarship for students pursuing careers in medicine or the natural sciences. We encourage you to study abroad as a pre-dental student. Beyond allowing you to explore the world, international experience gives you an edge in the keen competition for dental school admission. It was a love of science that first drew two pre-dental students together. 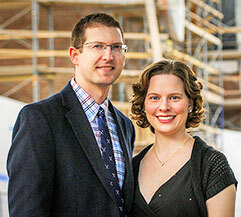 Married for six years, the couple endowed a dissection lab that will serve new generations of science majors.